Prepare penne according to package directions. Once cooked, toss with 1 teaspoon olive oil and chill. Cut off 1-2 inches of the base of asparagus and discard. Slice asparagus into 2-inch pieces. Toss asparagus and red onion in olive oil. Roast in oven at 450F until tender, remove and cool. Toast pine nuts in oven until golden. 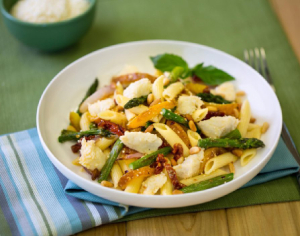 In a mixing bowl, add penne, asparagus, crab, roasted onion, roasted sweet pepper, red chili flakes, sundried tomatoes, lemon juice and dressings, lightly toss together. Place on serving dish, garnish with shredded parmesan, pine nuts and basil.